All the non-prescription products that are digested; the pills, capsules, tablets, and powders are being called releasers. Their makers may also call them secretagogues or precursors. Such products are dietary supplements that are regulated by the FDA's food laws. 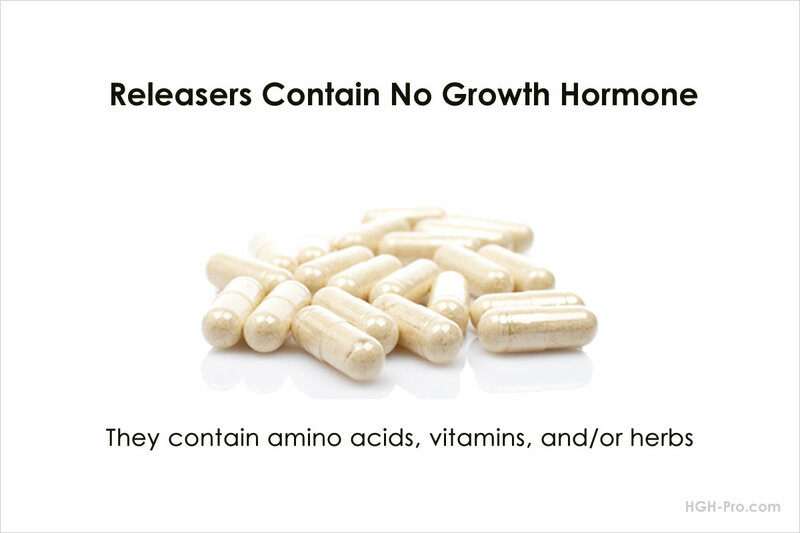 The main ingredients in the HGH releasers are amino acids, and some also contain vitamins and herbs such as ginseng. *Please see below for important information regarding these types of products. Amino acids are nothing new. They are the building blocks of protein. Bodybuilders and athletes have been taking these same amino acids in dietary supplements for years, long before there were any HGH products, and they still take those same amino acids now. We receive amino acids in food, especially meats, and in various health supplements and protein powders. As previously stated, many of the releaser type products also contain vitamins, especially the B vitamin niacin. Other ingredients that may be found in releaser products are herbs such as ginseng, ginkyo, mucuna pruriens, and others. We know that certain nutrients and herbs can provide benefits such as increased energy and improved memory so it may be that these ingredients are added to a product to make it appear to be more effective. For instance, increased energy and improving memory are two of the most popular benefits of increasing human growth hormone in the body, so if the person taking such a product notices these benefits he may think that his HGH level is increasing, when in reality he is only experiencing the benefits of the vitamins and/or herbs. Seeing these improvements is great, however, the person taking such a product may be missing out on other benefits that can only manifest when the body has more HGH to work with. Some amino acids have been found to help stimulate the release of growth hormone initially, however, the amounts needed of each of the amino acids are so much that they cannot be placed in 2 or 3 pills or capsules and so such products do not contain the amounts of each amino acid that may be required for pituitary stimulation. For instance, the recommended daily amount of arginine to take is 2 to 3 gm per day, that's 2000 to 3000 mg per day. The recommended amount of Glutamine is 1.5 to 6 gms per day (1500-6000 mg). Also, in clinical studies showing successful stimulation of the pituitary gland the amino acids were given to the patients directly into the bloodstream (IV), not by mouth, and so it is doubtful that the results would be the same since the HGH releaser products must go through the digestive tract. Above I included information about only two of the amino acids that may affect HGH release along with more information you should want to know about. You should also seek information about the other amino acids and ingredients found in any pill or powder product you are considering. *Before buying any product that is in either pill, tablet, capsule, or powder form find out how much of each ingredient it contains. Most do not contain the amounts needed to stimulate the pituitary gland. Taking large doses of amino acids can cause kidney and liver damage. Their breakdown can cause a buildup of amonia in the liver, which is toxic. The World Health Organization (WHO) states that once the body uses the amino acids it requires any excess amino acids will enter an oxidative cycle. During this cycle the kidneys must process and expel the excess from the body. This increased workload may possibly lead to kidney damage. Nitrogen balance after processing amino acids is also related to kidney function. Harris R. Lieberman, et al. noted in "Nutritional Neuroscience" that the body's nitrogen balance is the result of amino acid intake minus the amount of nitrogen the body excretes. If too many amino acids are ingested, especially if it is an unbalanced over-consumption, the body will begin excreting more amino acids than it takes in, which leads to a negative nitrogen balance. High doses of arginine can cause stomach upset and people with herpes virus should not take it because it can aid the replication of the virus. Also, people who take NSAIDS should be careful when taking arginine. People who are sensitive to MSG (monosodium glutamate) should be careful when taking glutamine because the body converts it into glutamate. Those who take anti-seizure medications should not take glutamine. In fact, anyone with liver or kidney problems should consult their doctor before taking any supplement that contains amino acids. Besides the problems that can arise from taking large amounts of amino acids it seems that any pituitary stimulation obtained by using amino acids is unsustainable. The pituitary gland appears to become resistant to the stimulation within the first 1-3 months and so the amino acid products may no longer work. Even the makers of the well advertised product called SeroVital admitted that they did not know whether the stimulation they claim was obtained at 120 minutes following the first ingestion of their product was sustainable. "Whether these GH changes persist over a longer duration or have other positive effects is being further examined." Of course one should not put much faith in clinical studies that measured the effectiveness of just the first dose! That is why scientifically accepted clinical studies measure the IGF-1 level over a period of several months rather than measuring the HGH level 2 hours after the first dose of a product. No product can be effective if the effects are not sustainable. Due to the great popularity and effectiveness of legitimate homeopathic sprays over the years there are now some sprays that contain amino acids, vitamins, herbs, etc., in homeopathic amounts. These types of sprays contain no homeopathic HGH, which is the only form of growth hormone contained in any non-injection product. Such sprays may be said to contain "HGH components" but don't be fooled, they contain no growth hormone at all. If you are wanting to take a spray product you should make sure it contains HGH. Those needing to supplement their amino acid and vitamin intake may do so at their local health food store or online without the need to purchase a more expensive HGH releaser product. Over these past years I have spoken with a good number of people who told me they had tried various releaser type products. Those who said they noticed some benefits also stated that the benefits only lasted for a month or two and then faded away, and so they contacted us looking for a different type of product. I believe optimum benefits can be received by taking a legitimate homeopathic HGH product while also ensuring the body has the nutrients it needs to build the new healthy cells that the growth factors of HGH will ask it to build.